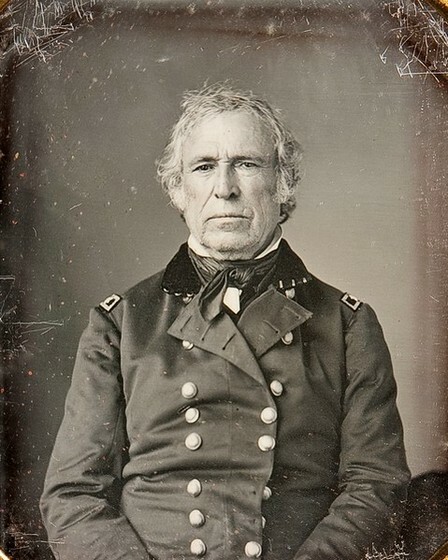 Died: July 9, 1850, Washington, D.C.
Before his tenure as 12th President of the United States, Zachary Taylor was the most popular man in America, a hero of the Mexican-American War. He was born in Orange County, Virginia, on November 24, 1784, to a wealthy planter family. In 1850, and on the eve of his death, Zachary Taylor's real estate holdings alone were estimated at $100,000, making him a very wealthy man during the era. Taylor had five daughters and one son, but his namesake, Richard, would later serve as a Confederate general and fight zealously to destroy the very principles his father had toiled a lifetime to establish. Although Taylor displayed a rather stern and intimidating pose in his many photos, he enjoyed participating in pranks and was a conversationalist with even the lowest of privates. "I should not be surprised if this were to terminate in my death. I did not expect to encounter what has beset me since my elevation to the Presidency. God knows I have endeavored to fulfill what I conceived to be an honest duty. But I have been mistaken. My motives have been misconstrued, and my feelings most grossly outraged." Despite treatment, Taylor, aged 65, known as the soldier's soldier, and "Old Rough and Ready," died at 10:35 p.m. on July 9, 1850. His wife, Margaret Mackall Smith "Peggy" Taylor, would die of natural causes two years later on August 14, 1852. Having served in the military some 41 years (1808–1849) before transitioning into the presidency on March 4, 1849, Taylor had devoted his entire life to serving the nation. For his many heroic acts and selfless acts of valor while in defense of the United States, Zachary Taylor remains the "Valorous President." Because "milk and cherries" was a peculiar cause of death, many conspiracies arose following Taylor's death. Many believed that the former U.S. President had actually been assassinated, or murdered by arsenic or some other poisoning. When asked by whom, political opposition of course, was generally the answer. To quell doubt and to conclude the final chapter of the nation's military president, the United States made an unprecedented decision in 1991 by performing an exhumation of the former president's remains. Was his death due to natural causes such as cholera or even a fatal case of gastroenteritis brought on by overindulging in cherries and milk? Was it arsenic poisoning perpetrated by his political enemies? Was he murdered by some other poison or means? The remains were exhumed and transported to the Office of the Kentucky Chief Medical Examiner on June 17, 1991. Samples of hair, fingernail, and other tissues were removed, and radiological studies were conducted. Taylor became the first president to have his remains exhumed, and tests conclusively showed that he was not assassinated by poison, thus silencing rumors and conspiracy theories. The remains were returned to the cemetery and reinterred, with appropriate honors, in the mausoleum. 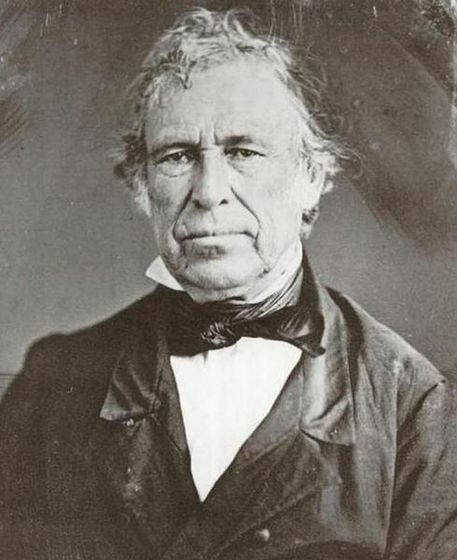 President Zachary Taylor, ca. 1844. President Zachary Taylor, ca. 1850. (Left) President Zachary Taylor wearing formal apparel in 1850. (Right) Half plate daguerreotype of General Zachary Taylor in uniform, ca. 1844. In 1808, he received his first commission as commander of the garrison at Fort Pickering, the site of what is now Memphis, Tenn. From there, he transferred to various frontier posts. In 1810, he married Margaret Mackall Smith, daughter of a prominent Maryland family. She followed him from post to post as their four daughters were born. Taylor won fame as an "Indian fighter" on the frontier. The family finally settled in Louisiana, where Taylor assumed command of the fort at Baton Rouge. Taylor's long military career began in 1808, when he became a first lieutenant in the United States Army's 7th Infantry. 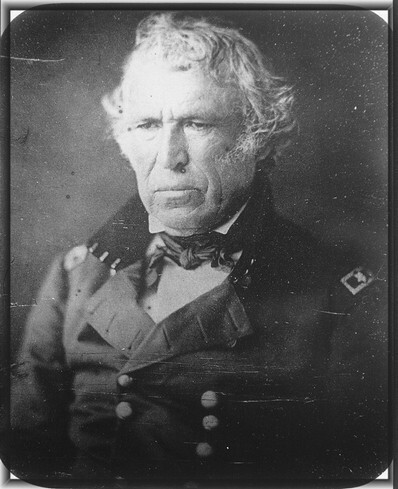 Nicknamed "Old Rough and Ready," Taylor was assigned to frontier posts during the War of 1812 and remained there during much of his army service. As a colonel, he took part in the Black Hawk War and later won wide popularity as a general in the Mexican War (1846-1848). Despite his successes in the Mexican campaign, he was often in conflict with the administration of President James Polk. In 1847, Taylor disobeyed orders by going on the offensive against the Mexican leader Antonio Lopez de Santa Anna, whom he defeated at the Battle of Buena Vista. A popular hero, Taylor was nominated for president in 1848 by the Whigs on the first ballot over Henry Clay, Daniel Webster, and Winfield Scott. In 1845, following the short-lived Republic of Texas, Texas was annexed and simultaneously granted statehood, which served only to exacerbate tensions between the United States and Mexico. Mexico City viewed with grave concern the U.S. expansion into northern Mexico as President James K. Polk (11th U.S. President) gradually implemented the doctrine of Manifest Destiny at the expense of Mexican lands. There had been existing disputed lands along the new state border, and now President James K. Polk ordered Taylor and his troops into the contested area. After winning two decisive encounters, Taylor triumphed over overwhelming odds in a battle against the Mexican Gen. Santa Anna at Buena Vista. "Old Rough and Ready" as Taylor was known, became a national hero. On May 8, 1846, General Zachary Taylor defeated a detachment of the Mexican army in a two-day battle at Palo Alto and Resaca de la Palma on May 8, 1846. The Battle of Buena Vista was won by the United States on February 23, 1847. General Zachary Taylor was the commander of American troops in this victory over Mexican General Santa Anna, who well-known for his Alamo conquest of 1836. Unlike Taylor’s contemporary and fellow Mexican-American War hero, Gen. Winfield Scott, Taylor was known as the soldier’s soldier. While not in battle, Gen. Taylor often wore civilian clothes, mingled with the common soldier, and was known for his sense-of-humor. While in military camp during the Mexican-American War and dressed in common clothes, a soldier, thinking that Taylor was a servant, asked him: “Can you tell me where I may find General Taylor?” Taylor replied, “I don’t know, but let me know when you find him.” As the soldier wondered away, Taylor displayed a rather kindly smile. Like his rider, Zachary Taylor’s horse became a national hero. Praised for his bravery in battle, “Old Whitey” became the subject of portraits, poetry, and music. When Taylor became President in 1850, the horse was allowed to graze on the White House lawn. After his victory, clubs sprang to support his presidential candidacy. By then, Taylor was a wealthy slave-owner and the South hoped he would support states' rights and the expansion of slavery into the new areas won from Mexico. The North pointed to his service on the nation's behalf and hoped he would side with the Union. Rare photo of President Zachary Taylor at the White House in 1849. (About) President Zachary Taylor at the White House. 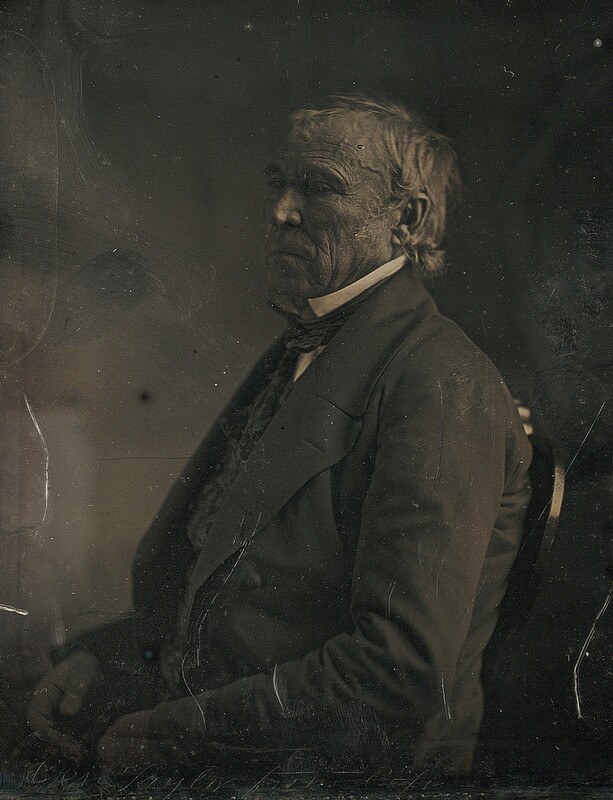 Daguerreotype of Zachary Taylor, taken at the White House by photographer Mathew Brady in March 1849. Courtesy of the Beinecke Rare Book & Manuscript Library, Yale University. At its 1848 nominating convention, the Whigs named Taylor a candidate for president, and he won the election that November. Also, during the era of great sectional discord regarding the extension of slavery, Taylor defeated Lewis Cass in the general election and became president. Despite the objections of Southern Whigs, Taylor, inflexible in the face of secessionist threats, favored a Union plan that would result in the admission of California and New Mexico as free states. The outstanding achievement of his administration was the Clayton-Bulwer Treaty of 1850, which gave Great Britain and the United States joint control over canal rights at the mouth of the San Juan River in Central America. Taylor died in office before passage of the Compromise of 1850. In 1850 the United States witnessed 55,000 emigrants move west along the Oregon Trail, with most bound for the gold fields of California. Levi Strauss created the first pair of "bibless" overalls in California, and according to the Seventh US Census, the nation's population was 23,191,867. On July 4, 1850, after attending celebrations in Washington, Taylor contracted a virulent stomach ailment that may have been cholera or typhoid fever, and he died five days later on July 9, 1850. More than 100,000 people lined the funeral route to see their hero laid to rest. Millard Fillmore, subsequently, was inaugurated as the thirteenth President of the United States. President Zachary Taylor was a very wealthy man during the era. The president's remains, and those of his wife, who died in 1852, were initially interred in the Taylor family burying ground. In 1883, the state of Kentucky erected a granite shaft surmounted by a life-size figure of Taylor. The United States erected a new limestone neoclassical-style building with a marble interior 43 years later. Over double glass-paneled bronze doors is the inscription "1784 Zachary Taylor 1850." A 50-foot granite monument topped with the life-size figure of former president Zachary Taylor was erected by the state of Kentucky in 1883. 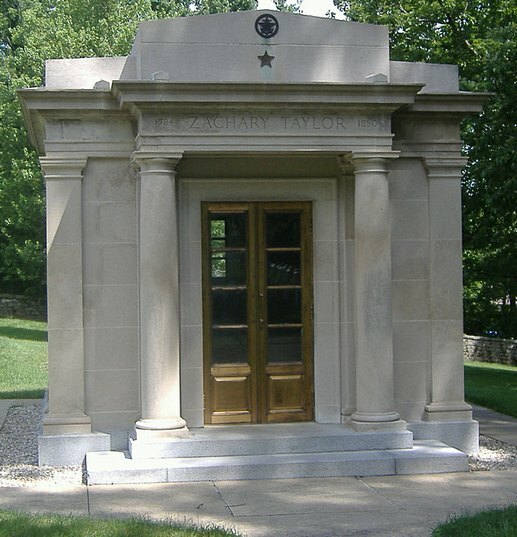 (Right) Taylor's mausoleum at the Zachary Taylor National Cemetery in Louisville, Kentucky. Each year on Nov. 24, Taylor's birth date, military personnel from Fort Knox conduct a wreath-laying ceremony there. Zachary Taylor National Cemetery was listed in the National Register of Historic Places in 1983. His passing was attributed to natural causes such as cholera or even a fatal case of gastroenteritis brought on by overindulging in cherries and milk. Some historians, however, believed the true cause to be arsenic poisoning perpetrated by his political enemies. In 1991, Taylor became the first president to have his remains exhumed, and tests conclusively showed that he was not assassinated by poison. His son Richard Taylor differed in many ways, and during the Civil War he was a well-known and respected Confederate general who fought against the very principles that his father had embraced and defended. Regarding Zachary Taylor's namesake, Confederate cavalry General Nathan Bedford Forrest stated that if the South had more generals like Richard Taylor it would have licked the Yankees. Sources: Library of Congress, senate.gov, Department of Veterans Affairs; Zachary Taylor National Cemetery (Louisville, Kentucky); National Archives; Yale University; National Park Service. He died unexpectedly after serving only sixteen months as president. His death occurred just as he was reorganizing his administration and attempting a recasting of the Whig Party. Mr. Bauer does a good job of describing the effect that Zachary Taylor had on the nation as well as that “personal side” of the soldier’s soldier. Most historians have written that Taylor's death and Fillmore's accession led to an abrupt change in presidential policy, but Smith believes that continuity predominated. Taylor wanted the controversies debated and acted upon as separate bills; Fillmore helped to accomplish it. Taylor had desired statehood for California and New Mexico with self-determination, or popular sovereignty, on slavery. As separate measures, the Congress admitted California and preserved a viable New Mexico as a “territory authorized to make its own decision on slavery.” With secessionists pitted against moderates in the southern elections of 1851, Fillmore had to choose between his constitutional oath and his personal antipathy to the new fugitive slave law. He supported the law and thereby helped keep southern moderates in power for a few more years. In fact, however, his efforts did not recapture a single slave. In Smith's view, Fillmore's most serious mistake was refusing a second term. Smith argues that Taylor and Fillmore have been seriously misrepresented and underrated. They faced a terrible national crisis and accepted every responsibility without flinching or directing blame toward anyone else. The political storm reached a crescendo in 1849, when California, newly populated after the Gold Rush, applied for statehood with an anti-slavery constitution, an event that upset the delicate balance of slave and free states and pushed both sides to the brink. As the acrimonious debate intensified, Taylor stood his ground in favor of California’s admission—despite being a slaveholder himself—but in July 1850 he unexpectedly took ill, and within a week he was dead. His truncated presidency had exposed the fateful rift that would soon tear the country apart. Taylor's short Presidency was shadowed by the issue then dominating all aspects of American national affairs - that of slavery. However, the immediate issue was the admission of New Mexico and California as states. Taylor confounded his Southern supporters, who had assumed that since the President owned slaves, he would support the pro-slavery position and refuse entry into the union to two states settled by Northerners and likely to be anti-slavery. Taylor recommended that the two territories develop their own constitutions and then request admission based on those constitutions. When Southern states threatened secession he warned them that he would use all his resources as commander-in- chief to preserve the union. He stated that if they seceded he would track them down like he had the Mexicans, and handle them in the same manner that he had deserters. Taylor's brief term in the White House also featured the still on-going question of balancing power between the Congress and the presidency. Recommended Reading: Letters Of Zachary Taylor From The Battlefields Of The Mexican War (1908). Review: If you are interested in this influential episode of US history, this book conveys it straight from the proverbial horse’s mouth. In contrast with often one-sided accounts like President Polk's and others’ memoirs, this book displays the human side of the invasion of Mexico. General Taylor reveals that he was conflicted in many standpoints ranging from ethical to military and political. Although he understood that it was his duty to serve his country and fight in a war against the weaker neighbor, Mexico, he shows us an emotional and personal side rarely seen in America’s top brass. Recommended Reading: American Creation: Triumphs and Tragedies at the Founding of the Republic (Hardcover). Review: From the prizewinning author of the best-selling Founding Brothers and American Sphinx, a masterly and highly ironic examination of the founding years of our country. The last quarter of the eighteenth century remains the most politically creative era in American history, when a dedicated and determined group of men undertook a bold experiment in political ideals. It was a time of triumphs; yet, as Joseph J. Ellis makes clear, it was also a time of tragedies—all of which contributed to the shaping of our burgeoning nation. Continued below..